Ve la publicidad como inversión y no como gasto, dedicándose profusamente a construir la circulación y actualizar el contenido editorial de su moderna industria de revistas. Su Advertising Code, en 1910, establece estándares que presagiaron el movimiento de "la verdad en publicidad". Rehusa a pagar la comisión de agencia a aquellos publicistas que compran espacios directamente. Formado en venta de periódicos, lanza un semanario, The Tribune & Farmer, en 1879. Su esposa, Louisa Knapp, es el origen de una popular sección para mujeres que se convierte en 1883 en Ladies Home Journal, el cual se distingue por notas de artistas y escritores, pasando el millón de ejemplares de circulación en 1900. Compra el Saturday Evening Post en 1896; para 1907 sus beneficios por publicidad superaron el millón de dólares. Curtis Publishing Co., Philadelphia. Cyrus Curtis was the founder of the modern magazine, making great contributions to advertising as he shaped the world of publishing. In 1872 and 1879 respectively, he started the People´s Ledger and the Tribune & Farmer. While neither enjoyed large-scale success, the popularity of the women´s features within these magazines led him publish one of America´s first women´s publications, the Ladies Home Journal. Curtis soon realized that while the contents of a magazine were important, high quality could only be provided at a low-cost with a strong base of advertising revenue. Recognition of this relationship served as the cornerstone of his success. 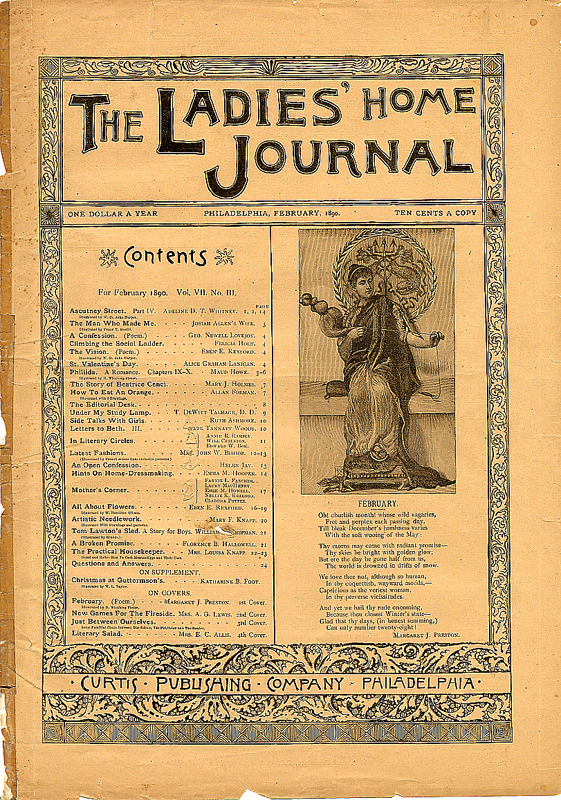 By investing over half a million dollars in advertising over a five-year period, Curtis was able increase the circulation of the Ladies Home Journal to over one million by 1900. In 1897 Curtis purchased The Saturday Evening Post, then a 16-page, un-illustrated weekly with virtually no following or paid advertising. Applying the same principles that he used with the Ladies Home Journal, he invested $1,250,000 in the magazine, hiring top writers and illustrators. By 1907 The Post´s advertising revenues topped one million dollars and in 1909 circulation also reached this benchmark. The Saturday Evening Post soon became America´s largest and most powerful magazine as well as one the best places to advertise products. With power and influence in hand, Curtis led his publishing empire into battle, fighting for truth and reliability in advertising. He personally oversaw all advertising in his publications. Stating, "It is our purpose to protect both our advertisers and our readers from all copy that is fraudulent or deceptive," he issued The Curtis Advertising Code. In addition to prohibiting medical, alcoholic liquors and cigarette copy; speculative real-estate advertising and advertising of an immoral or suggestive nature, he also sought to censor ads aimed at children and those that made false claims about "free" products. Most importantly, however, Curtis laid down three rules that defined his belief in the need for honesty in business. In his Advertising Code, he prohibited any advertisements that intended to deceive his readers, were extravagantly worded or that fell under the category of "knocking" copy, meaning those ads which attacked the quality of a competitor´s product. Not only did Curtis´ Code allow him to gain the confidence of both his readers and advertisers, it set the standard for all advertisers, media and advertising agencies today. The effects of his policies regarding advertising agencies helped to lead the industry down a more reputable path. Perhaps his greatest contribution was the push for the adoption of the commission system. Fierce competition among advertising agencies to sell the large amounts of space they purchased in magazines often led to questionable advertising. It also hurt the reputation of the industry as well as the financial position of magazine publishers. In 1901, Curtis Publishing Company signed a contract with an agency that paid a 10 percent commission on all space sold. It also required that the agency charge their clients the full rate. This prevented them from competing in terms of the amount they charged for space. Instead they began to rely on their ability to provide good copy, illustrative and marketing services. In 1936, Bruce Barton was quoted as saying that Curtis´ efforts "lifted the advertising agency out of the gutter of price cutting in which it had been struggling.... On that day the advertising agency became a business to which a man could give his life with full self-respect." Born in Portland, Maine, he was forced to leave high school after his first year when his family lost their home in the Great Fire of Portland in 1866. He held a variety of newspaper and advertising jobs in Portland and Boston before establishing his first publication, weekly titled People´s Ledger in Boston in 1872. In 1876, he relocated to Philadelphia, Pennsylvania in pursuit of lower printing costs. His first wife was Louisa Knapp. In 1883 she contributed a one-page supplement to the Tribune and Farmer, a magazine that was published by Curtis. The supplement became an independent publication the following year, with Louisa as the editor of this new magazine. Its original name was The Ladies Home Journal and Practical Housekeeper, but she dropped the last three words in 1886, and it became the Ladies Home Journal. It rapidly became the leading magazine of its type, reaching a circulation of more than one million copies within ten years. Louisa Knapp remained as its editor until she was succeeded by Edward William Bok in 1889. Bok became the son-in-law of Louisa and Cyrus Curtis several years later when he married their daughter, Mary Louise, in 1896. Bok retired from the magazine in 1919, but he made important changes to the magazine that made it even more popular. Curtis founded the Curtis Publishing Company in 1891; it published the Ladies´ Home Journal and the Saturday Evening Post, as well as several other magazines. A separate company founded by Curtis, Curtis-Martin Newspapers, Inc., controlled several newspapers, including for a time the major newspapers the Public Ledger, the Philadelphia Inquirer, and the New York Evening Post. Problems with managers at the newspapers led to poor financial returns from the publications, and eventually, the newspapers were sold. During his lifetime, Curtis´ businesses were extremely successful. The Ladies Home Journal was for decades the most widely circulating women´s magazine in the US and the Post had biggest circulation of any weekly magazine in the world. In 1929, the Post and the Journal together carried 40 percent of all US magazine advertising. One source lists Curtis as the 51st richest person ever, with a fortune of $43.2 billion (adjusted for inflation to 2008 dollars), which according to this source made him richer than either Paul Allen or J. P. Morgan. Curtis built a Renaissance revival style estate with landscaping designed by Frederick Law Olmstead in Wyncote, Pennsylvania. Cyrus Curtis also was known for his philanthropy to hospitals, museums, universities, and schools. He donated $2 million to the Franklin Institute, $1.25 million to the Drexel Institute of Technology for the construction of Curtis Hall, and $1 million to the University of Pennsylvania. He obtained a pipe organ manufactured by the Austin Organ Company, which had been displayed at the Philadelphia Sesquicentennial Exposition of 1926 and donated it to the University of Pennsylvania. It was built into Irvine Auditorium when the building was constructed, and is known to this day as the Curtis Organ. It is one of the largest pipe organs in the world. Curtis donated pipe organs to many institutions in Philadelphia and the biography retained in the library of his burial location notes that on the day of his funeral, all of those organs were played to honor him. In the summer of 1932, Curtis suffered a heart attack while aboard his yacht, the Lyndonia. While he was recuperating at Jefferson Hospital in Philadelphia, his second wife, Kate Stanwood Cutter Pillsbury, died suddenly. He remained in frail health until he died on June 7, 1933, less than two weeks before his eighty-third birthday, and he was interred in West Laurel Hill Cemetery at Bala Cynwyd, Pennsylvania. Soon after his death, most of the buildings on Curtis´ estate were demolished and his daughter founded the Curtis Hall Arboretum on the site. In the former headquarters of the Curtis Publishing Company, she founded a commercial center, the Curtis Center, which now houses a conference center, offices, a health club, shops, and restaurants. Cyrus Curtis was among the initial ten inductees in the American Advertising Federation´s Advertising Hall of Fame. Abstract: Cyrus Curtis was a well-accomplished magazine and newspaper publisher who was born in Portland, Maine, on June 18, 1850. Curtis started his career in magazine publishing at the age of 15, when he became founder of Young America. After moving to Boston and then Philadelphia, Curtis purchased the Saturday Evening Post in 1897 and founded the Curtis Publishing Company. Soon after the purchase of the Saturday Evening Post, Curtis and his wife, Louisa Knapp, founded the Ladies´ Home Journal, which is still in circulation. Curtis then shifted his interests from magazine publishing to newspaper publishing; however, Curtis did not succeed in newspaper publishing and had to sell his newspapers after losing money. Cyrus Curtis died on June 7, 1933, at his home in Wyncote, Pennsylvania. He is survived by his daughter, Mary Louise Bok Zimbalist, who has founded the Curtis Center and Curtis Institute of Music in Philadelphia, all named in honor of Cyrus Curtis. Cyrus Curtis was born Cyrus Hermann Kotzschmar Curtis on June 18, 1850, in Portland, Maine. Hermann Kotzschmar was a gifted musician, and for that, Curtis was named after him. Curtis was born to his father, Cyrus Libby Curtis, and his mother, Salome Ann Cummings. Curtis pursued a formal education until the end of ninth grade when he was forced to cease his education due to financial reasons. Because of financial struggles and the lack of a formal education, Curtis became a newsboy for the Courier and began to buy the papers and sell them for a little profit. This business did extremely well during the Civil War, when Curtis would sell these papers to soldiers around his town. Curtis continued to sell the Courier until he was offered a job at the Portland Press and then the Portland Argus, a position Curtis accepted because it paid more money. Many sources close to Curtis wrote that he often stated that his early newsboy jobs are what got him into publishing. Then on April 5, 1865, at the age of 15, Curtis left his position at the Portland Argus in order to start his own newspaper called Young American. Not only did Curtis publish this newspaper, but he also wrote the whole newspaper. Curtis continued to write, print, and publish the Young American in his Portland based plant until 1866, when a fire struck his plant and destroyed it. After the fire in Portland, Curtis was left to make a major decision: to stay and rebuild or to change locations and try again. Curtis decided to move to Boston three years after the fire that destroyed his Portland plant. Curtis chose to build another publishing plant in Boston and started a weekly business magazine, People´s Ledger, in 1872. However, another fire would hit Curtis´ publishing plant in 1872, resulting in Curtis once again losing everything that he owned. Faced with the decision of staying in Boston or moving, Curtis decided to move to Philadelphia, Pennsylvania, in 1876. The primary reason why Curtis decided to move to Philadelphia was because he learned that he could save fifteen hundred dollars in publishing costs there. While in Philadelphia, Curtis was forced to take an advertising solicitor position for the Philadelphia Press in order to earn enough money to build another publishing plant. Then, in 1897, Curtis had earned and burrowed enough money to renew his love of publishing. At this time, Curtis created the Tribune and Farmer, which was seen by many people as the beginning of the Curtis Publishing Company. 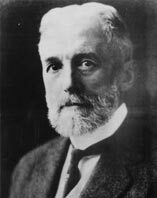 Curtis held the position of president of the Curtis Publishing Company from 1891 to 1922. Within the Tribune and Farmer, Curtis allowed his wife Louisa Knapp, whom he married in 1875, to write and edit a one page article called "Women at Home." Surprisingly, this one page article evolved into a full magazine, Ladies´ Home Journal, which by the end of the century had close to a five million copy print run. In 1897 the Saturday Evening Post was a magazine on the decline in popularity; however, Curtis saw some potential in the magazine and decided to purchase the Saturday Evening Post. While many people, including family and friends, advised against the purchase, Curtis didn´t listen and bought the Saturday Evening Post for $1,000. Eventually, after investing much of his own money, Curtis was able to hire George Horace Lorimer as chief editor of the Saturday Evening Post in 1898. After the hiring of Lorimer, the perseverance of Curtis allowed the Saturday Evening Post to once again become one of the most popular and venerated magazines in the United States. By 1962, the Saturday Evening Post had a peak number of copies in circulation (6,652,000). Then, in 1911, Curtis decided that he wanted to take on another challenge: the Country Gentleman. Approaching this challenge like the previous, Curtis worked very hard and within a couple of years the Country Gentleman was also a huge success. Curtis´ success in magazine publishing led him to pursue another area of publishing: newspapers. Curtis started out by purchasing the Philadelphia Public Ledger in 1913, then the Philadelphia Press and Philadelphia North America in 1920, which he combined and made the Public Ledger. Curtis continued in the newspaper publishing business with the purchases of the New York Evening Post in 1923 and the Philadelphia Inquirer in 1930. Unfortunately, Curtis didn´t see the success in the newspaper publishing field that he saw in magazine publishing. Curtis was forced to sell all of his papers because of lack of profit. Many people believe that these newspapers didn´t succeed due to lack of management and underachieving editors. Cyrus Curtis died at his home in Wyncote, Pennsylvania, on June 7, 1933. Curtis is survived by his daughter, Mary Louise Bok Zimbalist. His daughter has been instrumental in carrying on his legacy. Due to Curtis´ love for music and nature, Zimbalist founded the Curtis Institute of Music and the Curtis Arboretum, both of which are located in Philadelphia. Also in Philadelphia is the Curtis Center, which was originally the headquarters of the Curtis Publishing Company, but is now a host to many smaller shops and restaurants, a conference center, child care offices, and also a health club. To this day, the Curtis Center is a historical landmark in the city of Philadelphia. * Young American. Portland, ME. April 5, 1865. * People´s Ledger. Boston, MA. 1872. * Tribune and Farmer. Philadelphia, PA. 1879. * Ladies´ Home Journal. Philadelphia, PA. Feb. 16, 1883. * Country Gentleman. Philadelphia, PA. 1911. * Public Ledger. Philadelphia, PA. 1920. * Saturday Evening Post. Philadelphia, PA. 1897. * Philadelphia Public Ledger. Philadelphia, PA. 1913. * Philadelphia Press. Philadelphia, PA. 1919. * New York Evening Post. New York, New York. 1923. * Philadelphia Inquirer. Philadelphia, PA. 1930. * Bok, Edward. A Man from Maine. Philadelphia: C. Scribner´s Sons, 1923. * "Curtis, Cyrus Hermann Kotzschmar." Encyclopedia.com. 2005. 8 Nov. 2005. .
* "Edward Bok Sets Down the Record of His Chief." New York Times 8 Apr. (1923): 8, 23. * Flynn, Barbara L."Curtis, Cyrus H. K." American National Biography. 2005. 11 Nov. 2005. . This biography was prepared by Derek M. Howells, Spring 2005.